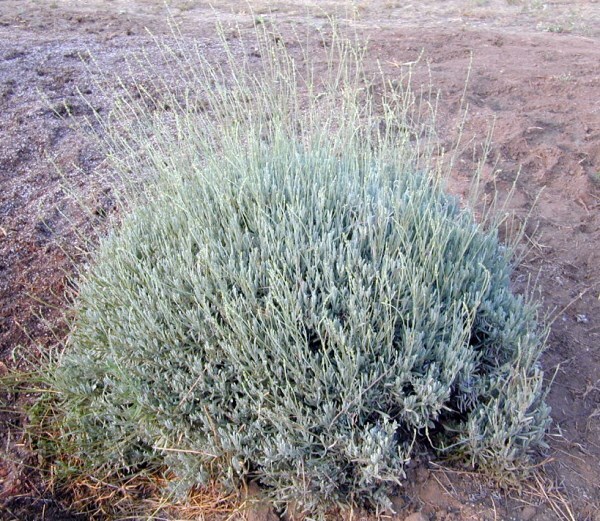 This Woolly Lavender shrub is getting ready to burst into bloom. Because we have pruned it properly and given it enough space, it will bloom on all sides like a porcupine. Woolly Lavender is the last lavender to bloom here so it extends our lavender season. 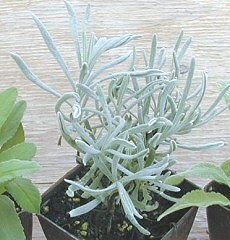 Truly silver, Woolly Lavender is a bit more tender than the L. angustifolias or the L. x intermedias. Make sure it has good drainage and it will make a beautiful addition to the garden with its smoky, dark purple blossoms. It looks great planted with dark green foliage plants like Rosemary or Lemon Verbena. This plant is often available in plug trays. These trays hold 128 of all the same plant. They are a great low cost way to fill a lot of space. Each cell is 3/4 of inch by an inch. Check here to see if Woolly Lavender Plug Trays are available. Woolly Lavender makes a great addition to our Zone 8-11 Fragrant Herb Garden Six Pack.